This recipe was sponsored by the National Pasta Association, but my love for pasta is all my own! Well, here’s some news folks. This mostly healthy eating RD hasn’t given up pasta, and I never plan to. I love it because it’s a quick and inexpensive meal that can be dressed up for company, or down for just me and you, and prepared in a matter of minutes. Perfect for a busy lifestyle. I also love pasta because it’s a perfect base to pair with protein and vegetables, to make a really healthy high energy meal. Finally, I love it because sometimes there’s nothing else that satisfies me like a big bowl of pasta. I used whole-wheat pasta in today’s recipe because I love the whole grain goodness and extra fiber and nutrients it provides. It’s not the way they would do it in Italy, but makes it just a little bit healthier. OK and while we’re on the subject, I don’t think they add leeks either, but I like the green-ness, and crunch. I thought about adding some spinach for even more veggies… Let me know if you try it. I’ll bet it’s delicious. Prepare an 8x8 inch baking pan or saute pan with cooking spray and set aside. Place bacon strips on paper towels and cook in a microwave about 4-5 minutes, or until crisp. Crumble bacon and set aside. Cook leaks in olive oil until wilted, and just starting to turn brown in spots. Mix together beaten eggs, cream, milk, parmesan cheese,salt, pepper and parsley in a medium bowl. Add bacon and leeks and stir well to combine. Lay pasta on the bottom of the baking or sauté pan. Pour egg mixture over all to cover. 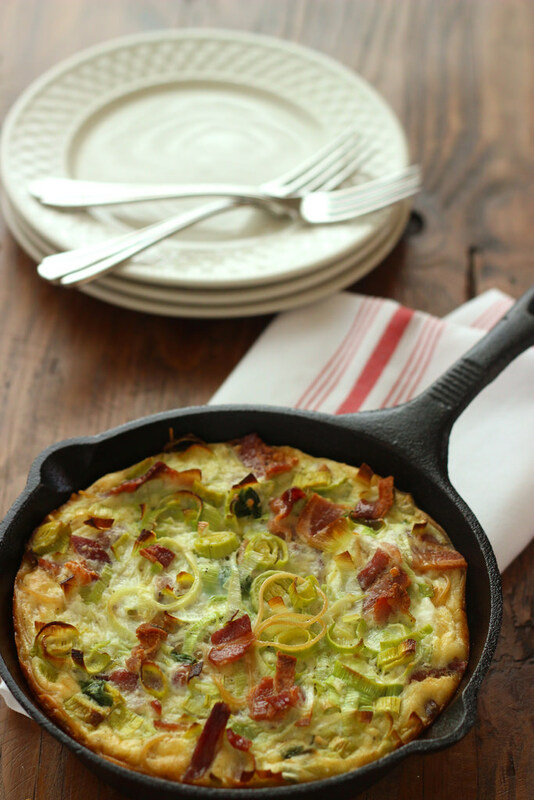 Bake for 15-20 minutes, or until frittata is puffed and lightly golden. Let sit for 5 minutes before cutting into slices. What’s your family favorite pasta dinner? Thanks so much for visiting and leaving a comment Karli! Hope you like it! Thanks Deanna! 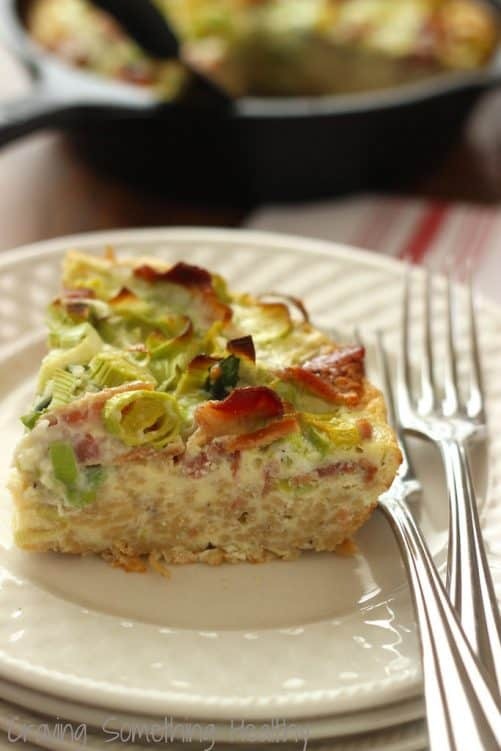 Kind of like a cross between Carbonara, spaghetti pie and quiche lorraine. Total yum! Why thank you! Thanks so much for visiting and pinning! Ooo, yummy yummy. 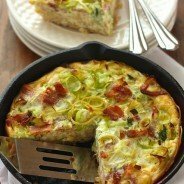 I love all the leeks! Made a vegetarian version with garlic, (onion powder since I was out of onions), broccoli, and spinach as the vegetables and it was heavenly. Thanks so much for this amazing recipe!